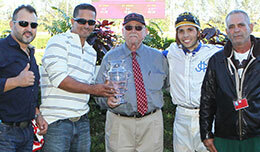 The winning connections of Habits Secret accept the Sawgrass Stakes trophy Sunday at Hialeah Park. Judd Kearl conditions the One Famous Eagle gelding for owner Cesar Dabdoub. The multiple stakes winning Texas-bred is out of Eyesa Glass, by Eyesa Special. Ridden by Rodrigo Vallejo, the 5-year-old has earned nearly $180,000. Heavy post-time favorite, Grade 1 winner Daytona B, was never in contention after hopping at the start under jockey Francisco Ramirez, Jr. Coming off three straight stakes wins, the son of First Down Dash was making his first start for trainer Yoani Abreu. Gregorio Garcia Garza owns the nine-time winner of nearly $490,000. Bielau Oaks bred Daytona B in Texas from the Toast To Dash mare Dashing Pana. Parti Favor, entered the race off a third place effort in the Hialeah Junior Maturity on January 17. Joe M. Davis owns-and-trains the Pyc Paint Your Wagon 4-year-old from the Feature Mr Jess mare Funparty. Rolando Pina had the riding assignment. Jesse Miles is the breeder. - See more at: http://stallionesearch.com/default.asp?section=6&area=4&story=18843#sthash.hgzpYq9K.dpufHIALEAH, FL�FEBRUARY 7, 2016�Multiple stakes winner Habits Secret defeated a tough field Sunday when he raced to a neck win over Eyesa Famous Eagle in the $25,000 Sawgrass Stakes at Hialeah Park. Daytona B and Parti Favor finished half-a-length back in a dead-heat for third.